Based on research for the War Letters 1914-1918 series of ebooks, this site contains links to a vast range of freely available online resources about WW1 from official histories and government reports to films, memoirs, theses, bibliographies, maps, paintings and much, much more. Get the first book free at Amazon. 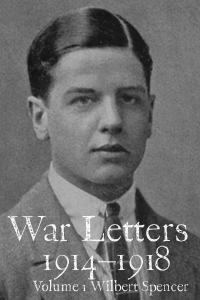 War Letters 1914–1918 tells a history of the First World War (WW1) through the words and letters of nine very different men who died in the fighting. The first five volumes are now available at Amazon. The subsequent volumes will follow at regular intervals throughout the next four years. Find out how to get the books. Included in the series are the letters of servicemen from Britain, Australia, Canada, New Zealand and the United States. Together their experiences cover the war on the Western Front, Gallipoli, Mesopotamia and the war at sea and in the air. Extensive notes accompany each book with links to a vast range of freely available online resources from official histories and government reports to films, memoirs, paintings and much more. A selection of those resources are available through this site.